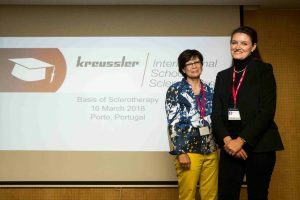 Wiesbaden, July 2018 – Kreussler Pharma, as the world’s leading manufacturer of sclerosants, has initiated the “Kreussler International School of Sclerotherapy (K.I.S.S. )“ with the assistance of a committee of experts composed of prominent opinion leaders from the field of phlebology. The aim of the training courses for physicians is to harmonise and optimise the sclerotherapy technique and thus the quality of the treatment method at an international level. For many years, sclerotherapy has been the method of choice for the treatment of small varicose veins, but also in the therapy of larger and saphenous varicose veins the success rates of foam sclerotherapy are comparable with those of endothermal and surgical methods – while retaining all the benefits of minimally invasive sclerotherapy. However, it is a generally accepted fact that using an optimal sclerotherapy technique is essential for treatment success. In addition, side effects are often the result of a suboptimal technique and can be reduced even further using the K.I.S.S. training platform, which is active worldwide. The concept and programme were created by a committee of experts, from which the trainers are also selected. The K.I.S.S. format is characterised by its high degree of practice-orientation and a large number of live sclerotherapy treatments during the training, which lasts a total of four days. The first K.I.S.S. training course, which took place this year from March 16th to 17th in Portugal, was well received by all participants. Further training courses are already being planned. Sclerotherapy is a well-established, modern and cost-effective treatment method for all forms of varicose veins. The sclerosant Aethoxysklerol celebrated its 50th birthday in Germany in 2016 and is successfully used worldwide. However, there is no end in sight to the success story, because it is impossible to imagine today’s clinical routine without Aethoxysklerol. Sclerotherapy is characterised above all by its high level of efficacy and safety with minimal stress for the patient. Although experts can perform sclerotherapy relatively fast and without complications, good diagnostics and a good injection technique are essential for optimal treatment outcomes and should therefore be learned and practised at training courses or in job shadowing programmes. 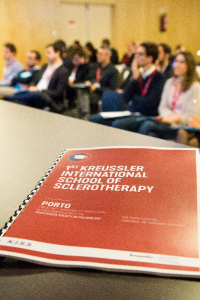 In order to further improve the quality of sclerotherapy and unify the standard at an international level, Kreussler Pharma established the “Kreussler International School of Sclerotherapy (K.I.S.S)“, together with a committee of key opinion leaders from the field of phlebology . The worldwide active training platform aims to optimise the success rate of therapy and further minimise the number of side effects. The training concept and programme were jointly conceived by Kreussler Pharma and a scientific committee of internationally renowned experts. The K.I.S.S. trainers are also selected out of this expert committee. To date, the format of K.I.S.S. is unique. On the one hand, this is due to its practical relevance and the large number of live sclerotherapy sessions performed during the training. On the other hand, it is because the participants complete a second training course a few months later, in which they report on their experiences with sclerotherapy since the first course. In a mutual exchange between the participants and trainers, the clinical cases of each participant are discussed in detail, so that the sclerotherapy technique can be further optimised. In order to ensure individual training, the number of participants is limited to 15 per training course. Following successful completion of the training course, which lasts for a total of 4 days, the participants receive a K.I.S.S. sclerotherapy certificate, attesting to their knowledge of sclerotherapy. The first K.I.S.S. training course took place in Portugal from March 16th to 17th, 2018, in collaboration with the Portuguese Society of Phlebology and Prof. A. Mansilha from the CUF Hospital in Porto. The trainers for the first course were Dr. C. Hamel-Desnos from Paris, the current President of the French Society of Phlebology, and Dr. F. Pannier from Cologne, former Vice President of the International Union of Phlebology (UIP). Both have been internationally renowned sclerotherapy practitioners and trainers for many years. Initially, participants acquired basic knowledge about liquid and foam sclerotherapy in a theoretical section. The main focus of the course, however, was on the practical part, which included numerous live demonstrations. In addition, all participants gladly took the opportunity of practising on sclerotherapy trainers and using the ultrasound equipment. The practical part, in particular, led to a lively exchange of knowledge between trainers and participants. At the end of two eventful days, all the physicians were united in their enthusiasm for sclerotherapy and the K.I.S.S. concept. “Passing on the many valuable practical tips and tricks from our trainers to the doctors is only possible thanks to the numerous live sclerotherapy sessions performed on patients. A good sclerotherapy technique and extensive expert knowledge are the prerequisites for an optimal treatment outcome and are thus in the interests of every patient. That is why we have taken this important step and initiated K.I.S.S.“, summed up Dr. S. Travers, managing director of Kreussler. Without doubt, the event in Porto was a successful start to the K.I.S.S. training platform, which aims to set a future benchmark for the international standardisation of sclerotherapy.